'So, what are you looking at? The green blocks show abnormal samples where reticulocyte percentage is HIGHER than normal - either 2 to 2.4% (light green) or above 2.4 to 5% (dark green). Remember that a higher reticulocyte % means more immature blood cells, suggesting EPO use or blood removal. 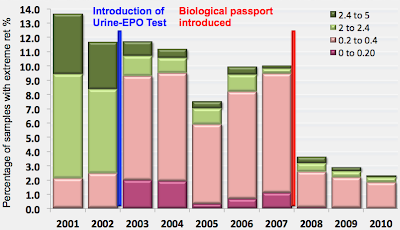 So quite clearly, in 2001 and 2002, you had a high percentage of samples that suggest EPO use - between 9% and 11% of all samples, and 80 to 90% of suspicious samples. No surprise there - this was the era of EPO use.